Come and see what’s cooking in Cardiff theatre right now. 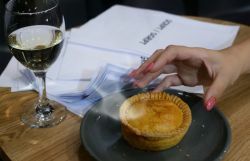 Sample the freshest theatre, a tasty pie and a refreshing drink for just £12.50. Get It While It’s Hot is Sherman Theatre’s brand new platform for emerging theatre companies in South Wales and the perfect way to relax after a day at work. For the very first Get It While It’s Hot we welcome Cardiff based Clock Tower Theatre Company with Shed Man by Kevin Jones.